Some houses have a flat balcony and the water outlet is just a piece of PVC Piping that just sticks out so that the water can run out. The problem with this is that at the point where the water drops, they either have a big rock at the bottom or some form of a hard surface where the water falls onto. 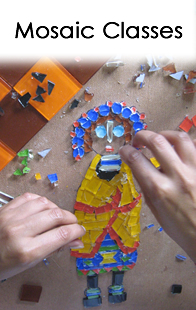 After a couple of years though, the water will wear down that surface and then you need to make a different plan again. The other problem is that when the water splashes onto the surface, it splatters everywhere and can cause some damage, especially if it is near a wall. In this article, I will show you how to make a quick and easy way to avoid all of those problems and to give some character and beauty to your water outlets without having to put up gutters which I think look unattractive. 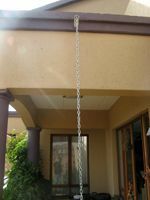 Measure the height of the drop from the water outlet on the balcony to the ground, plus an extra metre. 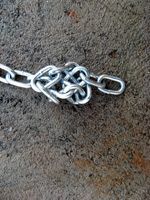 Most hardware stores have chains for sale and usually are quite cheap. 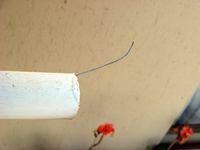 Take a decent length of wire, about 100 cm, and tie it to the end of the chain that you will be feeding through the PVC Pipe.  Take the end of the wire and start feeding it through the pipe. 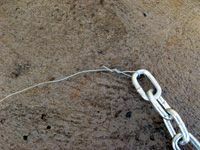 When the wire comes out on the other end, take hold of it and start pulling the chain through but be careful not to pull too much of the chain through yet otherwise the weight of the chain will just pull the other end of the chain right through and drop to the ground. 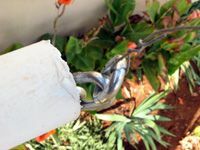 Once you have pulled through only a bit of the chain, remove the wire from the chain and then let the chain rest on the ledge first before letting it down. Take the other end of the chain and make a knot in it and the gently lower the other end of the chain while holding the knot. 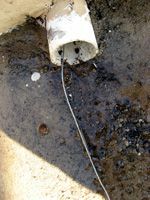 When the knot end reaches the outlet of the pipe, gently wedge it into the hole, being careful not to block the hole else the water will not run through and down the chain. 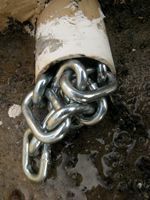 The bottom end of the chain should hang about 2 to 5 cm from the ground. 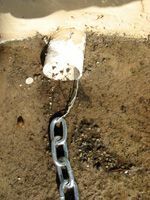 When it rains, instead of the water just running out of the pipe and splashing everywhere on the ground, the water will now run down the chain and into the garden without splashing or damaging your walls over the years.